From a kid’s perspective, time is a bizarre concept: there are 60 seconds and 60 minutes, but 12 hours... unless there are 24! And phrases like ‘a quarter til’ and ‘half past’ that we take for granted just seem to make their brains melt. 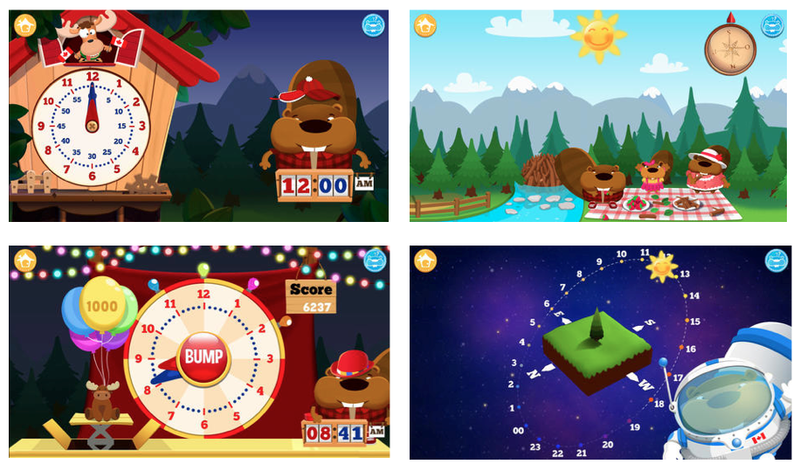 Tic Toc Time takes a holistic approach to teaching time; a family of beavers leads a progression of fun games that first explain using a compass and the movement of the sun and shadows before logically arriving at both digital and analog time-telling. A good time is guaranteed for all! Download it here now. Tic Toc Time, an award winning app that teaches kids to tell time, is normally $3.99. Download it here now for just $.99! What a wonderful game. I will keep this in mind for my son. What a cute app - This is definitely perfect for children. It is allot of fun for the kids! Nice app! I never thought of it that way. Kids must think adults are crazy! Learning time is one of the trickiest things for kids... that and negatives. This app is a great idea. It can help prepare students so they won't get overwhelmed. I hope more schools start using technology to help their students in class. I was pretty smart as a child, always made straight As, but I remember having such difficulty learning the concept of telling time. I would have loved something like this. What a neat idea! I love this, time is one of the hardest things to teach children! My niece would love this ! thanks! I think it sounds like a fun and useful app. I also think the graphics are nice and colorful! Great app, I don't have kiddos but will share with others. This is a very cute and educational way to tell time. Must be a great app to help kids. I'll reco it to my aunt and uncles so they can get it for their children. Looks like a great app to help with time. Awesome. My son has so much trouble at understanding all the quarter to and quarter passed. It is a hard concept. My little ones would so enjoy this app, looks fun and educational! This looks like such a fun app!! I may have to check it out for my little one :) Thanks! My kids would love this game! Thanks for sharing it so I could find it. Tic Toc Time seems like a great app for my almost 4 year old. It is definitely time to start working on telling time. Seems like a great, fun and interactive game for kids! Thanks for sharing! I love reading about your app of the week. My daughter could use this one. Cute! My son's too young for this, but I enjoy using technology in educational ways. My daughter would love to use this! Time is a difficult concept, so learning through fun is definitely the way to go! This does looks like a really cute app for the kids. Thanks for sharing. I will look into this one for our classes. They love things to help them with the time.